We Have Seen the Future and We Plan to Eat it | Sprezzatura, Y'all! It’s late summer and it’s almost harvest time for grapes and olives. This will be our future wine and olive oil. You see massive vineyards in the big wine areas like Chianti, but almost anyone with a spot of soil grows either some grapes or some olive trees. And some tomatoes. And basil. And figs. Well, you get the idea. They use their soil here and what wonderful soil it is. You can look at it and tell it’s fertile, rich volcanic soil that you could drop a seed into and it would sprout into wonderfulness. We love the freshness of everything here and we find ourselves looking ahead to what’s coming next. Fresh, juicy peaches now? In a few weeks we’ll have wonderfully gooey figs with our cheese. Ran out of fresh eggs? That’s OK, the chickens down the way are laying. Also with the change of season comes a change in the menus. More slow cooked, meaty sauces and polenta, more white beans in creamy gravy, and more of one my favorites, pappa al pomodoro – Tuscan tomato and bread soup. I love the light (if you can call sauces swimming in olive oil light) summer sauces but am really looking forward to the different flavors and techniques that come with the different seasons. Enough of what’s coming – back to the present. 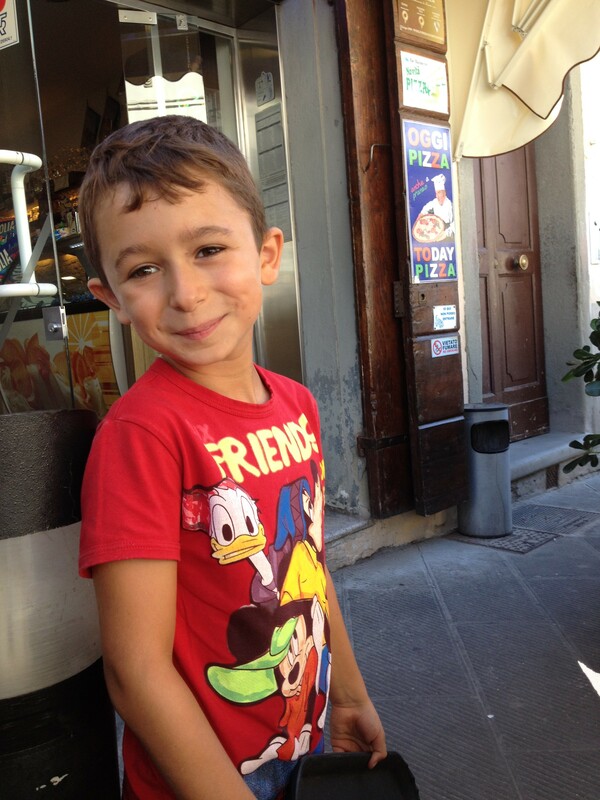 We had the world’s youngest waiter the other day at our favorite pizzeria. He was adorable and was working very hard. The next day we saw him running through town playing with a friend pretending to be soldiers with their plastic swords. We see so many things here that we would never see in America. Like children riding on Vespas with their parents. Or kids in cars with no car seat. Or kids just running around town with no responsible adult in sight, but many adults taking responsibility. It’s the way of the small town. Everyone looks out for each other and takes care of things, whether they’re their things or not. 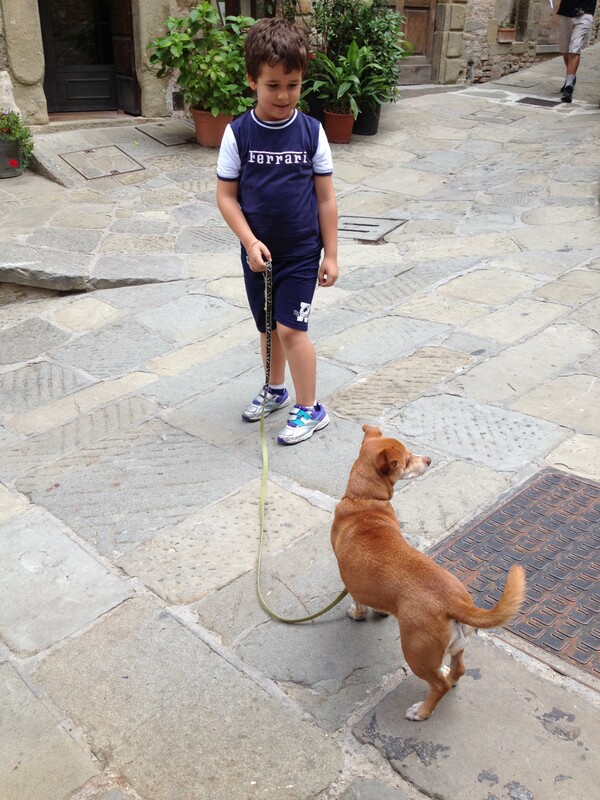 This little fellow, Nicolo, was desperate to make friends with our dog, Millie. She was tolerant, but not really interested. He was precious and tried and tried to get her interested in walking around with him. Everyone loves Millie – they all want to pet her and they all give her food. She loves it here because of that. We usually eat outside with Millie, but one day it was raining so we went inside. Most places don’t care if you have a dog. 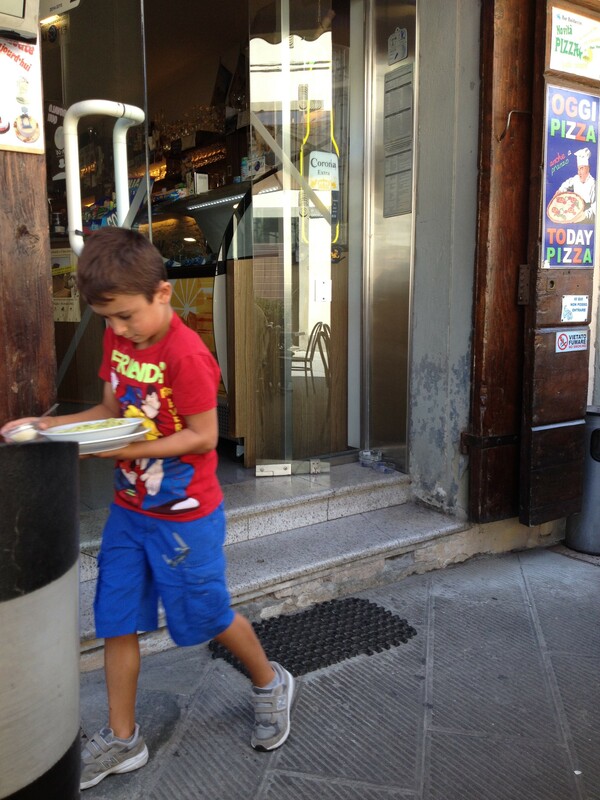 This was the same pizzeria with the world’s youngest waiter and they let us come in. 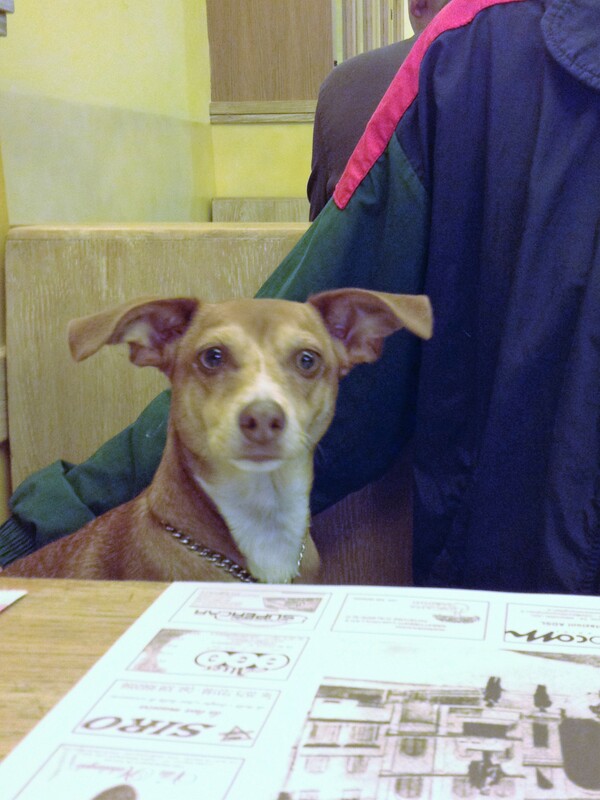 We sat at a booth and Millie sat up beside my husband like she had been doing this all her life. The owner came by and gave her a little snack. What a wonderful place – we get to go everywhere with our precious dog and we love it. So does she. Love this! Kisses to darling Millie! Absolutely! She’s having the time of her life – and getting even more spoiled than ever! Congrats to all! So happy for you! Thanks, Susan! We’re incredulous at this opportunity and so glad that we took the risk and made it happen. All worth it, Millie? I think so! We take things ( ourselves) a bit too seriously over here. I love the dog approach to life – what are we doing NOW? That flight is a distance memory for her and she savors each day. Yes, too serious is no fun and no way to live this gift of a life we have. Lighten up, everyone!